"Sahiwal is a conservative place," says Amna, "where girls furthering their education and studying at university is not thought to be a good thing. My family – especially my parents – supported my decision to study, however, and I made it through my undergraduate degree thanks to scholarships and loans as well as their help and support." Amna's determination to succeed was evident throughout her studies, and her results demonstrate her ability. "I received a distinction for my degree, and received a gold medal and a shield of honour in recognition of my awards and achievements," she says. "I was also awarded a Star Laureate Award by South Asian Publications for a record number of national achievements in debates and essay writing." Upon graduating, Amna was keen to pursue a quality Masters degree overseas, but the financial challenges meant that it remained an unaffordable dream for her. "Instead, I was offered a position at COMSATS as a Research Associate and Lecturer, so I started my career there," she says. "I also worked as an intern at a telecom company and as a volunteer in national and private institutions for public service, where I was shortlisted for some international training funded by the British Council. I eventually returned home, joining the University of Central Punjab where I became a Senior Academic Manager." Throughout this time, Amna's desire to study overseas remained undimmed. Her time working on projects to raise awareness of different aspects of health and education led her to decide that she wanted to study in the field of development, and she began researching which courses were available. 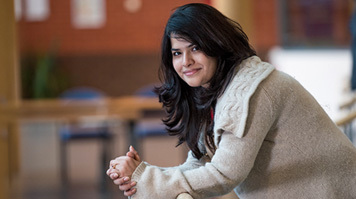 "There are a lot of reasons why I eventually decided on studying the MSc Development Studies at LSBU," says Amna. "Firstly, the modules all looked really interesting, and the department has an excellent reputation. Secondly, I already had friends in London so I knew I would feel at home immediately. Thirdly, the facilities, support and extra-curricular activities on offer really appealed to me, so I decided it was the right place for me." With finance still an issue for Amna, she applied for a Vice-Chancellor's Scholarship in the Excellence category, due to her previous educational achievements. The Excellence category of the scholarship is open to those with a first-class honours degree (or equivalent) who can show academic, practical and professional achievements. Amna was impressed by the help she got throughout her application process. "It was quite a straightforward process," she recalls, "though I did get a bit confused when I was requesting my CAS letter. The staff were all so helpful though, and helped me every step of the way until I was enrolled on campus." When Amna discovered that her application for a Vice-Chancellor's Scholarship had been successful, she describes herself as being "thrilled, delighted and overwhelmed". "I was actually thinking of deferring my start for another semester as I was worried about paying for the course," says Amna, "but securing the scholarship meant that my dreams could finally come true. It opened doors for me at just the right time, and I am very grateful to LSBU for selecting me for the scholarship." Amna hopes that she will take what she learns from her course at LSBU and use it to help change the world around her in a positive way. "I've seen a lot of social and economic friction in my life," she explains. "I want to make life easier for those looking to follow my path through education and life, and to guide them. I believe that my education at LSBU will give me the skills and experience I need to help me fulfil my dream of becoming a development worker."